A three-year partnership to promote France as a destination and embody the values of sport and especially running. 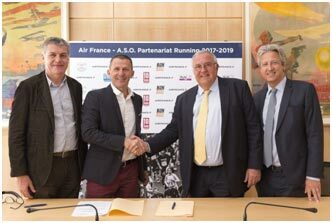 Until 2019, Air France becomes an Official Partner of a series of races organized by A.S.O. in France, with exclusive advantages for participants. Air France and Amaury Sport Organisation (A.S.O.) signed a three-year partnership. In this way, until 2019, Air France becomes an Official Partner of a series of sporting and themed events organized by A.S.O. in France in the field of running: the Fitbit Paris Semi-marathon, the Schneider Electric Paris Marathon, the 10 km l’Equipe, Run in Lyon, Run in Marseille, Run in Reims and the Run at Work and Run My City races. Within the framework of this partnership, French and international participants in these events will be able to benefit from special fares for their Air France-KLM flights to the venue as well as exclusive benefits with the Air France-KLM Group’s Flying Blue loyalty program, such as the possibility of purchasing their race number with air miles, a SkyPriority lane to pick up their race number as well as access to the “Air France Flying Blue Running” private area on departure and arrival. This partnership, signed by Patrick Alexandre, EVP Commercial, Sales and Alliances at Air France-KLM, Zoran Jelkic, SVP French Market at Air France and Yann Le Moenner, Managing Director of A.S.O. and Laurent Lachaux, Sales and Partnerships Director of A.S.O., is the result of a joint desire by the two French companies to embody the values of sport, especially running, and to promote France as a destination. “I am very pleased and proud to be signing this partnership agreement today between Air France and A.S.O. for the next three years. This partnership comes within the framework of Air France’s strategy to support and promote running, a sport which is well-loved by many of our customers. Thanks to this agreement, these runners will be able to benefit from the products and services of Air France and the expertise of A.S.O., one of the main organizers of sporting events in France”, said Patrick Alexandre, EVP Commercial, Sales and Alliances at Air France-KLM. “We look forward to further expanding our partnership with Air France for the next three years. Who better than Air France to travel to France, whichever country you’re flying from? This agreement will enhance the experience offered by A.S.O.’s running events, providing runners with an excellent all-round experience, from the time they leave home to the time they cross the finishing line. It also strengthens A.S.O.’s desire to promote France as a destination, which is at the heart of many of its events”, declared Yann Le Moenner, Managing Director of A.S.O.